Take a live PowHow class from anywhere in the world with Sa'diyya, International Belly Dance Artist. All you need is wifi and a webcam. "​I am ready to dance with you! I have over 15 years of experience teaching many different styles of Belly Dance to all levels of students. Let's have some fun!". If you miss a class, get the video! 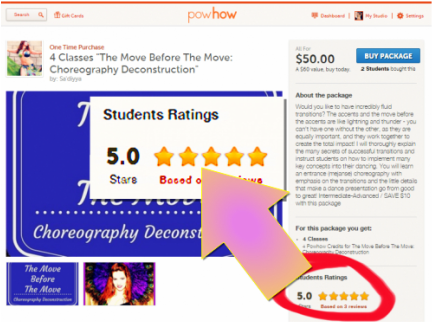 PowHow is an online video service for dance students that offers live interactive (kind of like Skype), live streaming and recorded dance classes. So you can watch and interact in a live dance class in real time with instructors and other students. You need a webcam (or a device with one) and an internet connection. All of the live classes are recorded, so if you miss a live class , you can go back and purchase the recorded streaming video. We've made it super easy for you to try Powhow. Sign up now to receive a special offer for 20% off your first class. Pick from hundreds of instructors and thousands of classes. Schedule a time for a private lesson or join a group class with a global community around the world. Join your class directly from the link sent to your email address. All you need is a computer, webcam, and high speed internet connection. Sign up now! What are PowHow students saying?! "Such a beautiful dancer, and sweet teacher. Will take more classes from her for sure!!" "It was my first class! Sa'diyya is so sweet and great instructor! . . . . I really recommend her classes!" "Thank you for a taste of what is available on powhow. Definitely a great way to learn from an exceptional teacher!" "Great class, the combination is beautiful and creative, I have to work on it! Everything went very good!! The quality of live class is definitely improved, the audio and video are great! I love Sa'diyya, she explains so well and she is gorgeous teacher and dancer! Thank you very much! "Sadiyya is the best!!!!! She is an amazing dancer and instructor. I am honored to take classes from her!!!" "Great class. I'm working on a choreography so this was really helpful. I will definitely be implementing all of the concepts here." "Class was really run and I liked the concepts you taught. . I loved working with a song with so many rhythm changes. Looking forward to the next class!" "I consider myself a beginner (took some Bellydance in the past, but haven't formally taken classes in a few years) and this was great for me to review and solidify the moves. I liked the specifics you provided on the movements; it really helped to start at the beginning again and make sure I was doing the movements correctly. Chest lifts and drops in particular I feel like I did better on than I ever have before.Footwork, I personally still need to work on. Thank you for offering this on PowHow, it's a great option for week nights!"